It has long been proposed that l-aspartate (Asp) is an excitatory neurotransmitter similar to l-glutamate (Glu) but with distinct signaling properties. 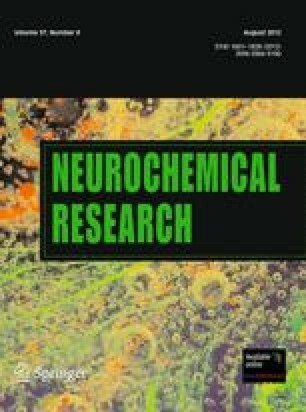 The presence of Asp in excitatory synapses of the medial striatum/nucleus accumbens of domestic chicks suggests that Asp plays a role of neurotransmitter also in the avian brain. Neurotransmitters are released from the presynaptic bouton mostly by Ca2+ dependent exocytosis. We used in vivo microdialysis to monitor the simultaneous changes of the extracellular levels of Asp and Glu in the medial striatum of young post-hatch domestic chicks. Microdialysis samples were collected from freely moving birds at 5 min intervals and analysed off-line using capillary electrophoresis. Event-related elevations of extracellular Glu and Asp concentrations in response to handling stress and to high KCl (50 mM) were observed. Increase of Glu and Asp on handling stress was 200 and 250 %, whereas on KCl stimulation the values were 300 and 1,000 %, respectively, if stress was applied before high KCl, and 150 and 200 %, respectively, in the absence of stress. In most cases, the amino acids showed correlated changes, Asp concentrations being consistently smaller at resting but exceeding Glu during stimulation. Using Ca2+ free medium, the KCl triggered elevation of Glu was reduced. When KCl stimulation was combined with tetrodotoxin infusion, there was no significant elevation in Asp or in Glu suggesting that most of the extracellular excitatory amino acids were released by synaptic mechanisms. The results support the suggestion that Asp is co-released with Glu and may play a signaling role (as distinct from that of glutamate) in the striatum of birds. This work has been supported by the Hungarian National Scientific Research Fund (OTKA 63415 and 73219) and TÁMOP-4.2.1/B-09/1/KMR-2010-0001.